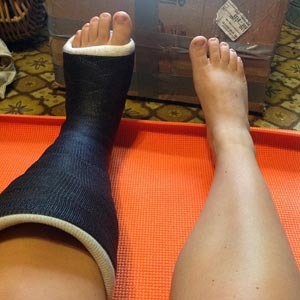 I didn’t realize it at the time, but when I got hit by a cab last May, it broke more than my foot. I was half a block from my apartment in Brooklyn, waiting to cross the street, when a yellow cab came through the intersection. As its passenger mirror hit me in the ribs, breaking off, the cab ran over my left foot. At the time, I felt pretty lucky to only have some bone bruises and the three fractures in my foot. But when I left the hospital and got home, nothing was right. Prior to the accident I had been working on myself. For the first time in my life, I was putting myself first: eating well, committing to my yoga practice, managing my anxiety without medication. I was great. Then, that impact with the cab sent my life back into the spiral of anxiety and depression it used to be. I never knew how much of my self-worth was tied to being independent (almost militantly so) until I got hit by a car. As a society we tend to gravitate toward relying solely on ourselves. We see it as a sign of being an adult. I had to go stay with my parents in upstate New York while I healed, and it was a nightmare. I was so frustrated and I took it out on everyone else. In some sense, I knew my injuries were temporary, but I found myself so mad about needing help. Why is it that it’s so hard for us to ask for help? I spent a lot of time thinking about that in the two months it took for my bones to heal. I thought I was “better” because I had done all of these things to take care of myself, but what I didn’t realize is that by making myself so self-sufficient and so independent, I was cutting myself off from the world. I was a yogi Boo Radley. At the time, I thought she meant that resting was just as important as asana. Now I know that it also means that sometimes, you need to lean on other people. I hadn’t realized that up until the accident, I hadn’t really been working on myself at all. I’d been struggling in silence, in yoga class, and in everywhere else. I thought I was “getting ahead”—but I was really just getting by. When I came back to class after my injury my teacher had us get into groups of three and we took turns supporting each other in Wheel Pose by using straps. It was then that I finally realized that I needed to let my guard down. Yoga taught me that asking for help is not the antithesis of independence—it’s part of it.